Dwaine Knight is the man who put UNLV golf on the national map, and in a big way. Knight burst onto the Las Vegas scene in 1987 and guided the Rebels to the NCAA crown in 1998. He also has coached two individual national champions in Warrren Schutte and Ryan Moore. Many of his players have gone on to success on the PGA Tour, and several have won Tour events, including Chad Campbell, Charley Hoffman, Chris Riley, Adam Scott, and Moore. 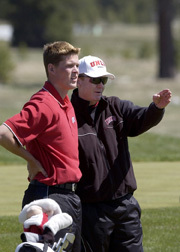 He also coached Las Vegas Golf Hall of Famer TommyArmour III at New Mexico, before moving to Las Vegas and UNLV.